There are many dishes that are prepared specially for lactating mothers. 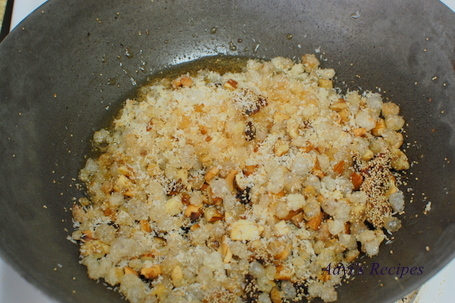 Many of these dishes have loads of ghee – it was a common belief that ghee which gives the necessary fats/calories and overcomes weakness and some other healthy ingredients. 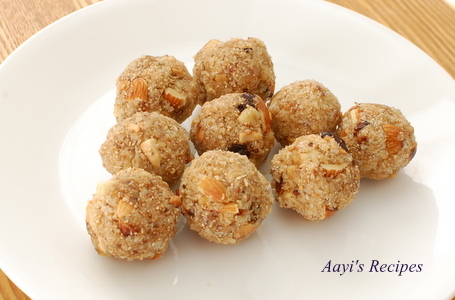 One very popular preparation is this dry fruits laddu – Dink Laadu or Dinkache Laadu(Marathi) or Antina Unde(Kannada). These laddus can be eaten by anyone, not just lactating mothers. They are very delicious. Dink is the edible gum. You can read more about it here and here. We found this edible gum in Indian store here. 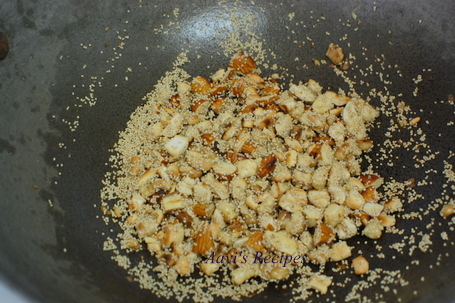 Normally the dink laddus have dry coconut, poppy seeds(khus khus) and dry fruits. 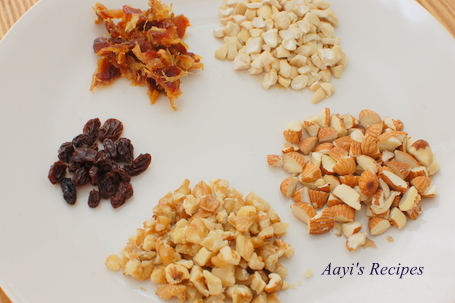 We used all kinds of dry fruits that we had. Usually Kharik/Kharuk(dried dates) is used in this recipe, but since we did not have that, we used normal dates. 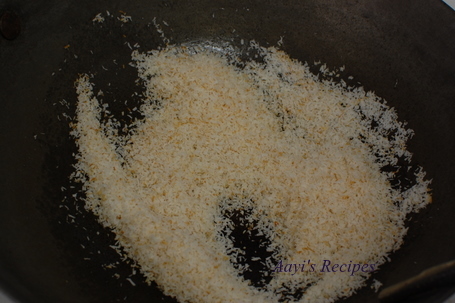 Dry roast coconut till it tuns slightly brownish. Take it out on a clean plate. 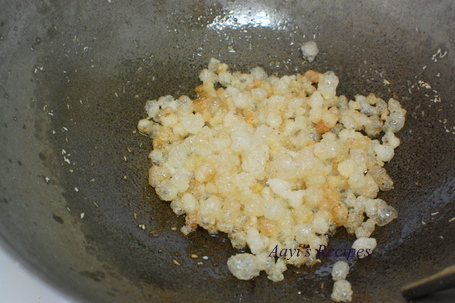 Heat ghee and add edible gum. The gum puffs up like small balloons. 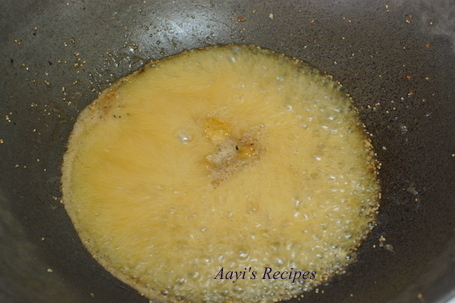 With a spoon take out on a plate, leaving behind any remaining ghee in the pan. 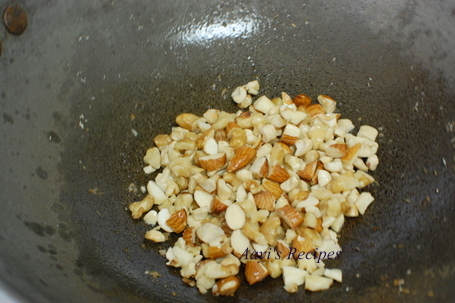 Add the cashews, almonds and walnuts, fry till they start to turn brown. Add poppy seeds and fry till they pop. 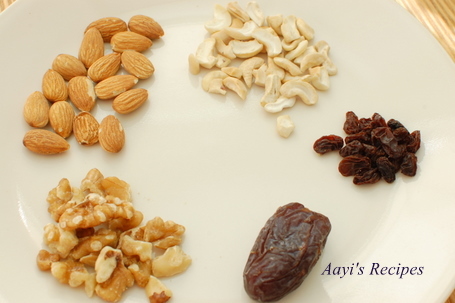 Add raisins and dates and fry for few moments. Take out on same plate. 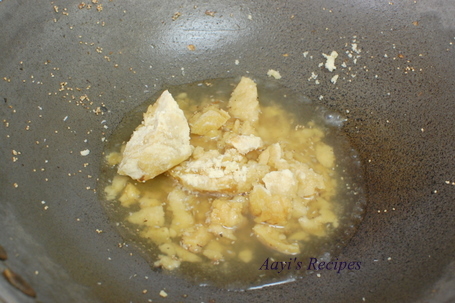 Bring to boil 1/2 cup water, add jaggery and cook till it forms syrup. To know whether the syrup is done, take some water on a plate and put a drop of syrup on it. If it sits like a crystal, syrup is done. Add all the fried ingredients and mix well. Add nutmeg and cardamom powder. Mix well. Make laddus when the mixture is still warm. 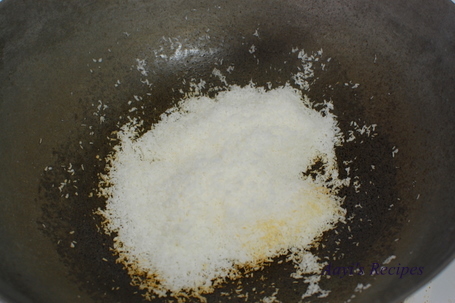 Apply some ghee to palms before trying to hold the warm mixture. 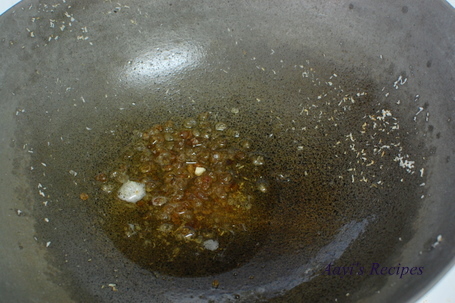 If the mixture dries out, sprinkle some water and heat it for few seconds. PS: If you are caloriesÂ conscious, reduce the quantity of ghee and use just enough to fry the ingredients. In the below picture, the crystals on the right are edible gum pieces. Below picture shows puffed up edible gum. Thanks Aunty! I tasted this at a friend’s house once and always wanted to learn how to make it. 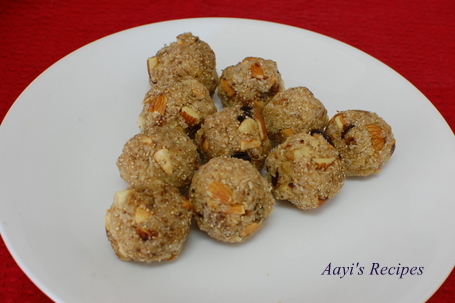 Thank you aunty for sharing delicious and nutrious laddu recipe. Luckily all the items are easily availble here. Going to try it this weekend. Thanks. We used to get such good dink laadoos in Mumbai, that no one at home ever tried making them. Hi How are you and your little one?Nice to see you back with one more delicious and wonderful recipe.Laddo looks very tempting and delicious. love these ladoos, my mom-in-law made this when my son was born…have to take this every day with a glass of milk…yours look perfect and delicious…thanks for sharing this! Varada aunty, a section on post-partum recipes, or “Balanthi” section was so much needed. Thanks a lot for the wonderful recipe. I am yet to try even & I know they will be delicious. We look forward to more recipes for lactating mothers. Thanks a lot again. Hope Shilpa & her new-born son are doing fine. I love the laddu, so I tried this recipe. But the amount of jaggery seemed to be too much for me. I may be wrong but is it supposed to be 1/2 cup jaggery or 1 cup. Thanks. Pls do reply,as the taste was amazing except for the sweetness. 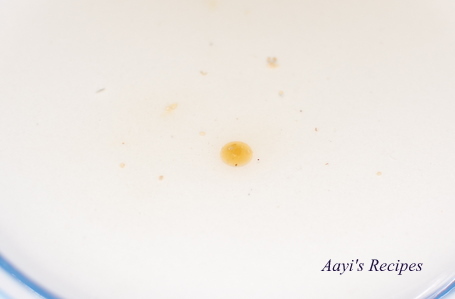 Aarya, The sweetness depends on type of jaggery. Some types are more sweeter than others. You can increase or reduce the amount according to your taste. These laddus look awesome. I am sure it will keep you healthy too. My grandmother’s side of the family had these laddus made for the womenfolk of the family every winter. The famous Gond and Soth ke Laddu with lots of dry fruits. 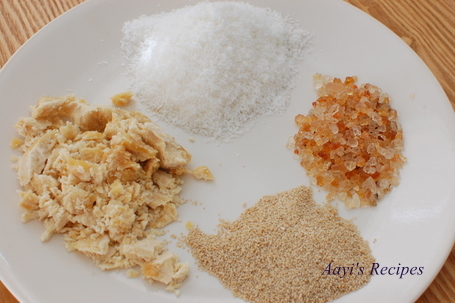 We use sugar instead of jaggery. Aunty this was a nice recipe and I was looking from long time. Thaks a lot for the gum laddu. It is really yummy. Kindly tell me when to give this laddu after delivery of the baby. Once again thanks for the same. I started eating it almost a month after my son was born. I guess it can be consumed before that also. We dont find edible gum here in Doha, Qatar. Is there anyother option? Were will u ind edible um in us? is it available in walmart? if yes, wat brand u used shilpa? I got it from Indian store. There was only one available. I have a doubt regarding the texture of these ladoos ! Won’t the jaggery lend them a chewy texture ? I want smooth ladoos , what should I do ? Nicely described the ingredients and manner of preparation but it is difficult to prepare in every household. I would like to know availability in Delhi/ NCR. Kindly provide address and telephone number etc. thanks looks yummy! how long do they keep in refrigerator? also do they keep in freezer? how long? I have kept them in fridge for almost for a month. Atishay upayukta! Laddoo pharach masta zale maze. Thank you sooo much ???? Is it ok to consume this in the first trimester and throughout the pregnancy? If not, what would you recommend during this period? Thanks! Is it ok to consume this during first trimester and throughout the pregnancy? If not, what would you recommend during this period? Thanks! I would be careful eating too much sugar/fat during the pregnancy. But in moderate amounts it should be ok. I personally ate my regular food during both my pregnancies, with lot of vegetables and fruits.